Gilbert was born Sara Rebecca Abeles in Santa Monica, California, the daughter of Barbara Cowan (née Crane) and Harold Abeles. Both her parents are Jewish. Her maternal grandfather is The Honeymooners creator Harry Crane. Gilbert has four older half-siblings. Her two siblings on her mother's side, Melissa Gilbert and Jonathan Gilbert, were stars of Little House on the Prairie. In 1984, Sara took the last name Gilbert for Paul Gilbert, her mother's first husband. Gilbert also has two siblings on her father's side, sister Patrice and brother Joseph. Following appearances in television movies and a commercial for Kool-Aid, at 13 she landed the role of Darlene Conner, the sarcastic middle child, in Roseanne. Gilbert was a cast member in the show's nine-year run (1988–97), for which she wrote a fourth-season episode story (the teleplay was written by the Guild Writers for the show) called "Don't Make Me Over". Her contribution was considered so important to Roseanne that the show's producers juggled storylines and taping schedules to allow her to study at Yale University while remaining in the cast, shooting remote segments of Darlene at a soundstage in New York. Gilbert has appeared on The Simpsons, 24, Will & Grace, Law & Order: Special Victims Unit and Private Practice. Starting in 2004, she had a recurring role as smart and sarcastic medical student Jane Figler on the long-running hospital drama ER; her appearances spanned seasons 11-13. 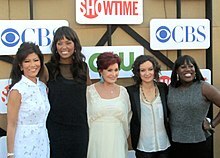 The Talk co-hosts Julie Chen, Aisha Tyler, Sharon Osbourne, Gilbert and Sheryl Underwood in 2012. Gilbert returned to prime time television in the fall of 2005 in the sitcom Twins on The WB network. The sitcom was canceled after one season, when the WB and UPN networks merged as The CW and dropped a number of shows. She also had a recurring role on the short-lived CBS sitcom The Class as Fern Velch. From 2007 to 2010, Gilbert appeared in episodes of the CBS TV series The Big Bang Theory as Leslie Winkle, a scientist friend of Leonard Hofstadter played by Johnny Galecki, who had previously played Gilbert's love interest David Healy on Roseanne. In the second episode of the second season of The Big Bang Theory, Gilbert was elevated to the show's main cast, portraying again a potential love interest of Galecki's character, and at one point a love interest to Howard Wolowitz (Simon Helberg). By January 2009, it was announced that the writers did not know how to write for her character full-time, and her status was reduced from regular to recurring. Winkle was discontinued after Amy Farrah Fowler and Bernadette Rostenkowski became prominent characters. Gilbert is a co-host and executive producer of The Talk, a talk show that premiered October 18, 2010. Gilbert won a Daytime Emmy in 2016 for Outstanding Entertainment Talk Show as producer and creator of the show. An eight-episode revival series of Roseanne was developed, with Gilbert as an executive producer. It was confirmed on May 16, 2017, and the eight episodes, picked up by ABC, began airing March 27, 2018. Due to the revival's strong ratings and positive critical reception, a second season was announced. However, on May 29, 2018, in the wake of controversial remarks made by Barr on Twitter regarding Valerie Jarrett (VJ, an advisor of former president Barack Obama), ABC cancelled the revival after a single season. Gilbert distanced herself and the show from Barr's tweets saying that her comments are "abhorrent and do not reflect the beliefs of our cast and crew or anyone associated with our show". On June 21, 2018, ABC announced that the network had ordered a 10-episode spin-off of Roseanne with all of the regular cast members except Barr planning to return. The series is titled "The Conners" and premiered in October 2018, with Gilbert starring and serving as an executive producer. As a teenager, Gilbert dated her Roseanne (and later The Big Bang Theory) co-star Johnny Galecki (their characters also dated). During their relationship she realized she was a lesbian. She remains close friends with Galecki. In 2001, Gilbert began a relationship with television producer Allison Adler. They have two children—a son, Levi Hank, born to Adler in October 2004, and a daughter, Sawyer Jane, born to Gilbert in August 2007. For many years, Gilbert remained private about her sexuality, choosing not to publicly discuss her personal life. In July 2010, as she prepared to launch her talk show, The Talk, Gilbert confirmed that she was a lesbian. In August 2011, Gilbert announced that she and Adler had separated amicably. 1994 Dead Beat Martha Film is based on the killings of Charles Schmid. Boys Life 3 Emily/Michelle Short film; Segment: "$30"
Episode: "New Kid on the Block"
1994 Saturday Night Live Herself – Host Episode: "Sara Gilbert/Counting Crows"
2002 Rugrats Cindy (voice) Episode: "Cynthia Comes Alive/Trading Phil"
Grey's Anatomy Kim Episode: "Suicide is Painless"
2016 Supergirl Sara Gilbert Episode: "Falling"
2019 Weird City Jathryn Episode: "Smart House"
^ a b Staff. "Sara Gilbert". Biography.com. A&E Networks. Retrieved March 16, 2016. ^ "Sara Gilbert". Academy of Television Arts & Sciences. ^ "Sara Gilbert". TVGuide.com. Retrieved 2014-03-31. ^ "Sara Gilbert Biography". Fancast. 1975-01-29. Archived from the original on January 9, 2009. Retrieved 2010-10-04. ^ Ausiello, Michael (January 23, 2009). "'Big Bang Theory' scoop: Sara Gilbert taken off contract". Entertainment Weekly. Retrieved October 4, 2010. ^ "Roseanne' TV show revival in the works with main cast set to reprise roles". New York Daily News. Retrieved 2017-04-28. ^ Pallotta, Frank; Stelter, Brian (May 29, 2018). "ABC cancels 'Roseanne' after star's Twitter comments". CNN. Retrieved May 29, 2018. ^ Park, Andrea (May 29, 2018). "ABC cancels 'Roseanne' after Barr's tweet". CBS News. Retrieved May 29, 2018. ^ Gilbert, Sara [@THEsaragilbert] (May 29, 2018). "Roseanne's recent comments..." (Tweet). Retrieved 2018-05-29 – via Twitter. ^ Goldberg, Lesley (June 21, 2018). "ABC's 'Roseanne' Spinoff Officially a Go – Without Roseanne Barr". The Hollywood Reporter. Retrieved June 21, 2018. ^ "Hot L Baltimore, The". Williamstown Theatre Festival. Retrieved November 2, 2018. ^ Takeda, Alison (2013-09-13). "Sara Gilbert: I Realized I Was Gay While Dating Johnny Galecki". Retrieved 2014-03-31. ^ "Levi Hank Gilbert-Adler". MyHeritage.com. Retrieved April 9, 2018. ^ "Sara Gilbert and partner welcome second child". People. August 6, 2007. Retrieved 2007-08-06. ^ "Sara Gilbert Gives Birth to Baby Girl". Fox News. August 13, 2007. Retrieved November 8, 2009. ^ "'Roseanne's' Sara Gilbert confirms she's a lesbian". CNN. July 30, 2010. ^ Jordan, Julie. "The Talk's Sara Gilbert, Partner Break Up". People. August 24, 2011. Retrieved August 25, 2011. 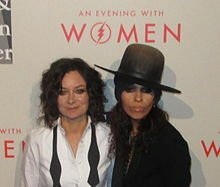 ^ Grossberg, Josh "Sara Gilbert Talks Relationship With Linda Perry on The Talk". E Online. November 30, 2011. Retrieved December 1, 2011. ^ Rice, Lynette (2013-04-08). "Sara Gilbert announces engagement on 'The Talk'". Entertainment Weekly. Retrieved 2013-04-09. ^ Oldenburg, Ann. "Sara Gilbert, Linda Perry welcome baby boy". USA Today. Retrieved March 2, 2015. ^ D'Zurilla, Christie (March 2, 2015). "Sara Gilbert, Linda Perry are parents of a new baby boy". Los Angeles Times. Retrieved October 21, 2017. ^ "ABC Cancels 'Roseanne' Following Star's Racist Tweet". TVWeek.com. May 29, 2018. Retrieved November 2, 2018. ^ "SARA GILBERT". Television Academy. 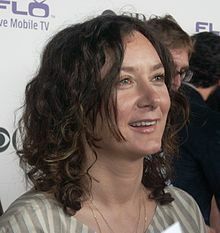 Wikimedia Commons has media related to Sara Gilbert.